CynogenMod 13 ROM is one of the most popular customs ROM and comes with lots of features which you can’t see on any other custom ROM. 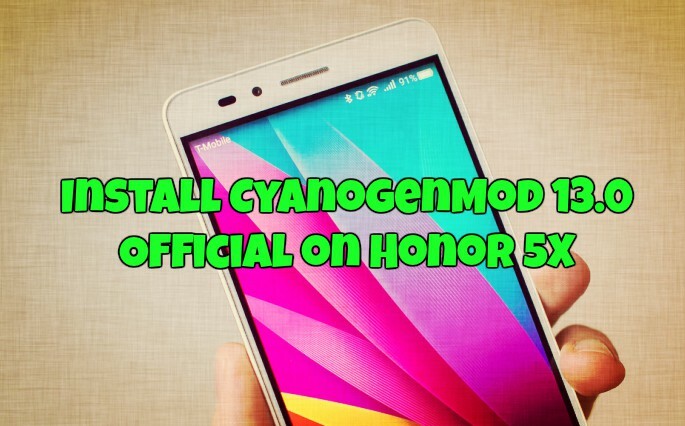 Official CynogenMod 13 ROM is now available for the Honor 5X Android Phone. The custom ROM is based on the latest Android Marshmallow 6. If you are the Honor 5X Android Phone user, then you can try this new CM 13 ROM on your phone and get lots of new features like battery optimizations, Doze, better App permissions, Now on Tap, Status bar customization and much more. The ROM is stable, and you can use the same as the daily drivers and enjoy all the new features of Android 6 on your phone. Here in this guide we will help you to Download and install CyanogenMod 13.0 Official on Honor 5X Android smartphone. To get started all you need the phone with TWRP recovery and Full ROM Zip file. The guide is only for the Honor 5X (KIW-L24 / L22 / L21) users so don’t try this on any other device. Read all the instruction very carefully and follow all of them step by step on your phone. Before that do take the full backup of your phone, so you can easily restore them on your phone. Warning: Tecnobuzz.net is not responsible for any damage that might happen to your phone during this process. Step 1. Once download both CM 13 and Gapps Zip file. Save them on your Phone’s Internal meryr and rember the location of the files. Step 2. Now Boot your device into recovery mode. First Turn Off your phone, now press and hold “Volume Down+Power Button”. Step 3. Now you will see the TWRP Recovery Home screen. From here Tap on Wipe > Advanced Wipe and Select Wipe cache, Dalvik cache, System, and data and swipe to confirm it. Step 4. Now go back to the Home Screen of TWRP recovery and Tap on the Install Button. Step 5. Now locate the ROM zip file & swipe to Install the ROM file. After the process completes, Flash the GApps zip file. Step 6. Once Completed. Wipe Cache and Dalvik. And after that Reboot System. That’s It. Now you phone will boot on the Latest CM 13 ROM. First boot will take some time so be patient. Let us know if you have any questions via comments below.